I'm not going to use scratch anymore but if you want to contact me my discord tag is Javi#4337. 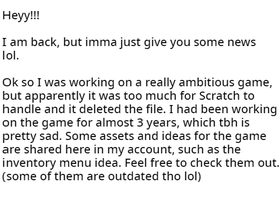 Update: Scratch 2.0's offline editor deleted the game's file. I'll leave scratch now. At least I can say I DID try to finish it.